A star that keeps on shining pays attention to his own behavior and the effect it has on others. He’s attuned to his emotions, knows what sets them off, and manages his reactions. Even when the pressure’s on, he stays calm and is realistic about what can be accomplished. When he trips, he picks himself up, finds the lesson in it, and moves on. Most important of all, when he needs help, he asks. Stellar leaders are rare, so when one starts to go off the tracks, not only is it painful to witness, it can have a serious impact on the business. It’s often hard to understand what’s happening and what to do about it. When HR or an internal coach offers support, it can feel like a serious intervention and add to an already high level of anxiety. No one likes to fail, but a high-achiever is a champion at beating himself up over it. A chronic sense of failure can confirm, once and for all, the nagging belief that he is an imposter and the jig is about to be up. Harsh and obsessive self-criticism can wreak havoc with his sleep, diet, exercise, family life, and relationships with friends. Not taking care of himself shortens his fuse, igniting more problems and adding to his growing list of perceived failures. 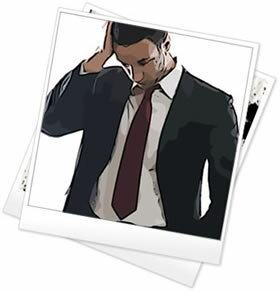 If a strong performer begins making wrong-headed decisions, missing goals on a regular basis, or just behaving badly, it can look like an inability to handle the everyday stress that comes with the job. 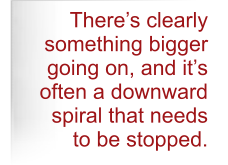 But there’s clearly something bigger going on, and it’s often a free fall that needs to be stopped. We work together to define the lessons emerging from his experiences and to develop strategies to use when the heat’s turned up. At this point, he’s able to narrow down his priorities and re-focus on what’s most important. Self-criticism is rampant among high-achievers. It seldom leads to derailment, but it always wastes precious energy and holds leaders back from being their best. Without exception, everyone can benefit from more balanced perspectives on themselves and the world around them. Coaching can help leaders find that balance and learn the lessons in their failures so that they lead with the energy, confidence, and enthusiasm necessary for their organization to succeed. Click here to see how coaching helped one high-potential leader get back on track.